David defeated the Philistines and the Moabites, whom he put many to death. He fought Hadadezer, the king of Zobah, and captured his chariots and hamstrung most of the horses. David conquered Damascus. God gave David victory wherever he went. He gained a lot of booty. The King of Hamath brought David tribute. David defeated the Edomites and was a just ruler for Israel. 3) David defeated the Philistines, Moabites, Zobah (Syria), Damascus, Hamath, and Edomites. Victory meant they would finally have peace, and with peace comes economic prosperity. 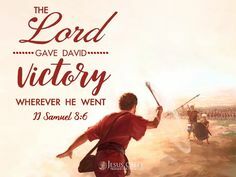 David’s victories were complete. 4) The Lord gave David victory wherever he went. People acknowledge God in their success by saying so, by doing the right thing, and by thanking Him. Also, when they are humble, knowing it is all in God’s power, they acknowledge Him with their hearts. 5) He dedicated the plunder to God. There would be less poverty if God were given resources. More people would be blessed. There would be less dependence on the government for care of the poor, the homeless, and the widowed. The world would be a less selfish place. 6) Part personal Question. My answer: He is obeying God. He is doing what is just and right for all his people. I hope my kids describe me as doing what is right for them and others. Putting others first before myself. Thinking of others. God does need to be given more of the credit for what He does in our lives. It’s all Him, and none of it is us. Metheg Ammah was another name for the Philistine city of Gath (compare 1 Chronicles 18:1). When David became king, the Philistines were taking territory from God’s people. Under his leadership God’s people began to take territory from the enemy. Why was David so harsh against the Moabites? Scholars do not know. David’s war against Moab and his harsh treatment of their army seemed out of place considering that David’s great-grandmother was a Moabite (Ruth) and that he entrusted his mother and father into the care of the Moabites (1 Samuel 22:3-4). It may be that the Moabites killed or mistreated David’s parents. We are not told. God did not want Israel to destroy every neighbor nation. Generally, God wanted Israel to be so blessed and strong that other nations were “taxed” by Israel, thus recognizing their strength and dominance. The king of Zobah (a Syrian kingdom) ran into David on his way to capture territory to the Euphrates. David’s dominance extended all the way to the Euphrates River. David could not care for so many horses while on military campaign, and he could not give them back to the enemy. David obeyed the principle of Deuteronomy 17:15-16 and absolutely refused to trust in horses as military weapons. His trust was in God instead (Psalm 20:7 and 33:16-17). David took what was the glory of the enemy and transformed them into trophies of the power and goodness of God. Those shields of gold were set in the temple and testified to God’s work in and through David. Take away: God loves to take people and things that are “trophies” for the Devil and make them trophies to His power and grace. 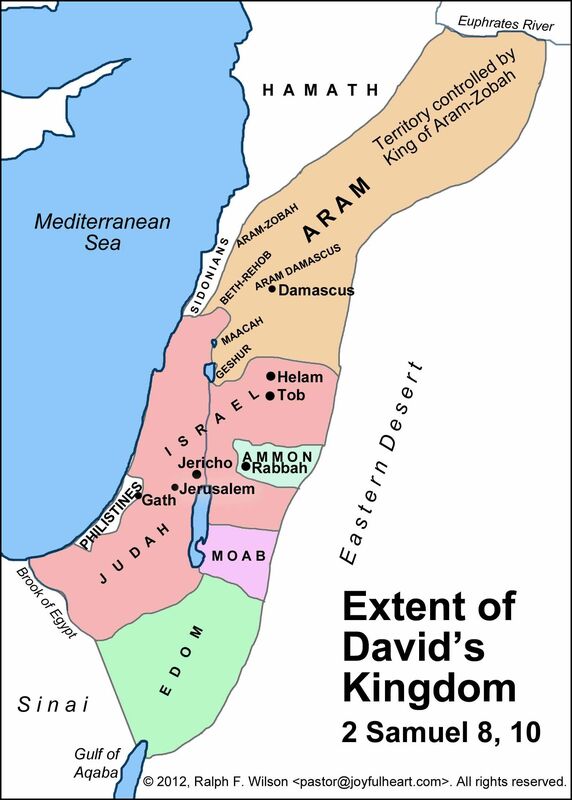 Fun fact: Israel possessed more of the land God promised to Abraham (Genesis 15:18-21) under David’s reign than at any other time. Because David allowed God to subdue Him, the nations were subdued before David. No great ruler succeeds by himself. Success comes with support. We never find such a list regarding the organization of King Saul’s government. This is because David’s government had much more form and structure than Saul’s. There is a limit to what we can be and what we can do for the LORD without order and organization. Together we are stronger and delegation is key to being able to accomplish more for God’s kingdom. The Cherethites and Pelethites were hired soldiers from Crete.